The rebuilding of the NYC, Long Island and NJ coastal areas post Hurricane Sandy is a critical opportunity to impact how America responds to climate change. When I suggested this at a recent 350.org meeting in NYC, most people thought that rebuilding is about adaptation – and that our focus should be mitigation. I think that this moment in NYC presents critical opportunities for both. Shaping the rebuild conversation to center on a realistic assessment of how bad climate change is going to be in the future (well beyond Sandy’s footprint) and how we must adapt to keep our city livable will strengthen our arguments for the mitigation measures that are required at all levels of government to keep the “business as usual” scenario from coming to pass. It’s not enough for our Senators and Governors to speak out in DC for money for emergency relief and rebuilding – we need them to argue for carbon taxes, taking democratic control of existing fossil fuels so they are never used (Bill McKibben’s Terrifying New Math), cuts in greenhouse gas emissions, and a rapid transition away from fossil fuels and toward renewable energy, energy conservation, and energy efficiency. NY politicians should support efforts (e.g., taxes, litigation) to hold fossil fuel companies financially responsible for the damages causes by climate change and divest public pension funds from fossil fuel companies. They also need to address the fact that low-income people and communities were disproportionately negatively impacted both by the storm and by the relief efforts. And they need to commit to a transparent and inclusive democratic decision making process on rebuilding. We need local officials to have the courage to make the hard decisions. Not to make fast decisions, to rebuild as quickly as possible, but to make the right decisions. Which means to stop giving the green light to rebuild in areas that will be flooded. Yes, we need money to move our power systems, water and waste treatment facilities out of flood areas. We need to figure out how to protect subways and other immovable infrastructure from future flooding. But we also need to bring an end to development in flood zones, like barrier islands and in-filled wetlands and marshes. While we recognize the incredible emotional attachments people have to their homes and their desire to rebuild as soon as possible, our politicians must say that it’s no longer realistic in this new era of climate change. We can’t continue to throw away taxpayer dollars and put people’s lives at risk by ignoring the realities of climate change. Climate change is a train that has already left the station and is accelerating. We can’t stop climate change – it is already occurring. We have precious few years to work to reduce how severe climate change will be and to figure out how best to adapt to it. A recent study (2012 DARA Climate Vulnerability Monitor ) commissioned by the 20 countries most impacted by climate change estimated the 400,000 people worldwide – including a 1,000 children a day – die annually due to hunger and communicable diseases aggravated by climate breakdown; this number is much larger if the health impacts of carbon pollution is included. The estimated economic cost is already $1.2 trillion a year. Those numbers are going to rise – likely by a large amount. 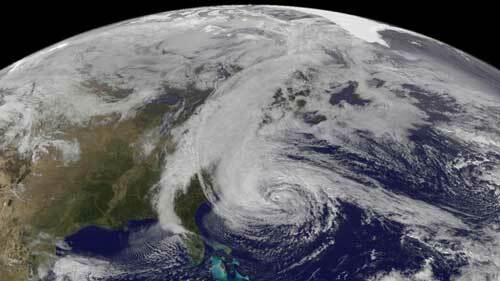 Sandy was the second storm of the century to hit parts of New York in the last year. A new report predicts that sea levels are likely to rise by four feet within the next century – meaning that a tidal surge the size of Sandy would hit NYC every three or four years. And it is important to recognize that climate predictions have been made very conservatively. As scientists have refined their understanding and models of the earth’s systems the predictions have grown ever more serious. A recent study showed that actual sea level rise over the last several years was significantly higher than predictions made in the most recent IPCC report and many climate predictions fail to account for the unexpected melting of the tundra that is releasing massive amounts of methane, an especially potent greenhouse gas. No one – yet – is predicting the melting of all of the Antarctic, Greenland and Arctic ice, which would raise sea levels by about 200 feet. But there is a big range between 4 feet and 200 feet. And the tidal destruction that was unleashed on downstate NY and New Jersey was from a category 1 hurricane – not a category 4 like Katrina. Federal, state and local government officials took Sandy’s approach seriously and began the emergency response before it hit, having learned tough lessons from Katrina and Irene. Yet the metropolitan area was still knocked flat on its back and has struggled mightily to get back up. Sandy exposed how fragile much of our society’s infrastructure really is. Millions were left without power and heat for over a week, and tens of thousands are still struggling with these basic needs more than a month after the event. Hundreds of thousands of people were stranded for days without access to basic necessities before NYC seemed to grasp how bad the situation was and started responding to them. Rather than pointing fingers at ineffective political leadership, this emergency should serve as a wakeup call for how vulnerable our food, water, power, communication, gasoline and transportation system are to severe weather. This is especially true in high-density urban areas with all of their complexities. 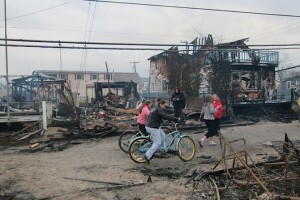 How many knockout punches like Katrina and Sandy will occur before one day a major urban area just can’t get back up? More people are beginning to realize that it is the poor, the elderly, the ill and disabled that will be hardest hit by climate change. Like Katrina, this was true for Sandy, starting with the tens of thousands of public housing residents who were trapped and virtually abandoned in tall buildings without heat, electricity, food, water or elevators. People who are already struggling daily basic necessities don’t have the resources to respond to a disaster, to find alternative housing or to move out of the area until the emergency is over. They are also far more likely to have jobs that don’t pay them when suddenly no one can work for a few weeks. Climate change scientists predict that there will be massive displacement of people worldwide, with tens of millions of refugees struggling to find new homes. Food and water shortages are expected to set off riots and armed conflicts. We can pretend that such chaos will occur only in third-world countries, but both Katrina and Sandy left major US cities teetering on the edge. In NYC, a coalition of community, faith and labor organizations are calling on our political leaders to address the economic divide and ensure transparency and democratic participation as we rebuild and prepare the city for further impacts of climate change. For the next year or so – until a massive hurricane, drought or fire devastates another part of the country – NYC will be at the epicenter of national awareness around climate change. We have a moral obligation to seize this moment of leadership to push past the corporate-funded denialism and evasion that has dominated Congress and to put in place concrete measures to reduce our greenhouse gas emissions. NYC has a unique opportunity to show how a society can rise from tragedy to change course; to plan and allocate appropriate resources for adapting to and mitigating climate change; and, to protect and serve the interests of all its members. 1 Comment on "Climate Change and Rebuilding NYC Post-Sandy"
According to Bogumil Terminski it seems reasonable to distinguish the general category of environmental migrants from the more specific (subordinate to it) category of environmentally displaced people.